Greening the economy at the local level will bring jobs, prosperity, and help us address the environmental challenges we’re facing. That is the finding of Green Economy at Community Scale, by Professors Tim Jackson and Peter Victor — two of the world’s top ecological economists and leading thinkers on issues of environmental sustainability and economic growth. A green economy is not business as usual — with some clean technology added in. The transition is more fundamental and more exciting. It requires rethinking work and productivity, and developing a new vision of enterprise, investment, and a money economy that can support a shared and lasting prosperity. For Jackson and Victor, prosperity is more than producing and consuming material stuff. It’s about providing the capabilities for people to flourish in their community — socially and psychologically — without destroying the ecological assets on which our future prosperity depends. 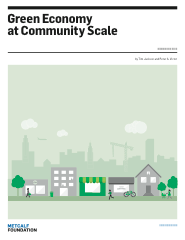 Green Economy at Community Scale is one of the first research-based explorations of the green economy at the local level. The report is drawn from the authors’ original analysis of the flow of natural and financial assets at the national level. It analyses conceptual foundations, and provides empirical evidence, for more sustainable community-based economic activities. The final section of the report draws together findings and identifies positive steps towards the creation of green local economies.